The Christ Apostolic Church’s General Evangelist, Prophet Hezekiah Oluboye Oladeji has said that many people’s lives are in shackles because they failed to involve God in the journey of their lives. The Prophet said this at the all-night programme held last Friday at the end of a five-day open crusade by the Oba Akinyele’s region of the Pentecostal church to join in the celebration of the centenary anniversary of the church worldwide. 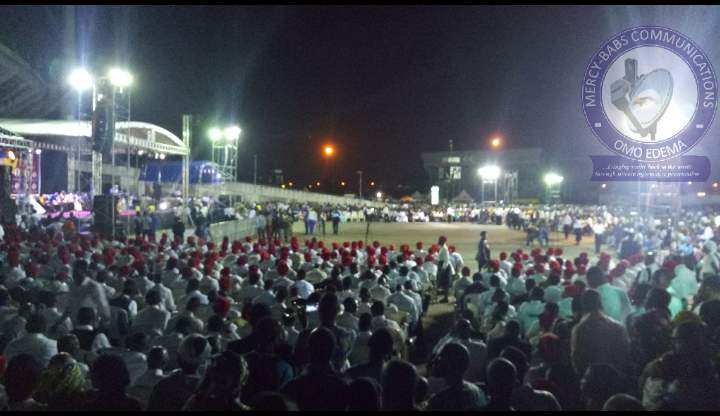 The vigil which was held at the National Stadium, Surulere Lagos had the executives of the church in attendance such as the President, Pastor Abraham O. Akinosun; General Superintendent, Pastor S. O Oladele; General Secretary, Pastor E. E. Mapur; Financial Director, Pastor J. F Omitinde and hosts of regional leaders. While ministering, Prophet Hezekiah expressed that many Nigerian youths would have become great pillars and saviours for this generation and the generation to come but their lives remain under the influence of evil forces and terrible addictions. He said that they were easily influenced and robbed of their God’s given glories because they failed to know and follow the ways of the Lord. “When God is removed from your thinking and actions, you open the door of your life to Satan to come in. It’s time every body comes back to their creator who has power to give divine direction and meaning to all lives”, he declared. Earlier in his welcome speech, the Regional Superintendent of the region, Pastor Isaac Adebayo said the mission of the Christ Apostolic Church is to take the gospel to everywhere around the world. And while thanking God for His faithfulness to the Church, he joyfully announced that the crisis that had been rocking the Pentecostal church for many years has been resolved. In his own speech, the worldwide President of the church, Pastor Abraham O. Akinosun said the root of the church is traceable to God Almighty who called His ministers such as David Odubanjo, Oba I. B. Akinyele, Daniel Orekoya, Apostle Joseph Ayodele Babalola, Joseph Sadare and others and that God built them with unction to function. Akinosun said that the church started in 1918 with a praying group—the group was praying for rival in Africa. At the peak of his speech, the president urged all the members of the church to use the period of the centenary anniversary to seek God like never before, adding that the move of God is much more needed in this present day. According to him, “we need to walk with God like never before in order to bring about the move of God. The end time revival needs to start with you. Please allow the Holy Spirit. “So as the CAC centenary celebration’s train lands into Lagos, I welcome you to the more important event in annals of Pentecostalism at this moment which is the commemoration of 100 years of seamlessly working with God in Christ Apostolic Church worldwide”, Akinosun said.